If you are a strong adherent of acting legends either Mohanlal or Mammootty, you would keep away the fan interest and wish to see them together on silver screen. Even though the M Town heroes have shared screen space in a number of movies, Ranjith's upcoming flick 'Kadal Kadannoru Mathukutty' would be a delicious toast for the movie enthusiasts. Padayottam, Sesham Kazhchayil, Sesham Kazhchayil, Sesham Kazhchayil, Avidathepole Ivideyum, Kariyila Kattu Pole, No 20 Madras Mail Gandhinagar 2nd Street, Harikrishnans, Narashimham and 'Twenty Twenty' are few among the long line of movies which brought the actors together. After a break, now it's Ranjith's turn to cast the M Town lead actors in his latest movie. Heard from the grapevine, the title 'German Returns' has been christained to 'Kadal Kadannoru Mathukutty', while Mohanlal and Dileep would be playing their real life characters in the movie. The story of the movie Kadal Kadannoru Mathukutty' revolves around the life of Mathukutty (Mammootty), a german NRI malayalee. While the actors of malayalam movie industry reach germany for a stage show, Mathukutty who is in charge of receiving them meets Mohanlal, Dileep, Prithviraj and other super stars. More interestingly, Mathukutty even meets Mamootty which is another fun part of the movie. 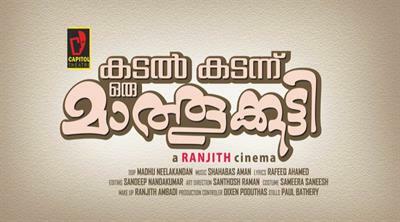 Being a project donned by Ranjith, spectators do keep high expectations which creates huge buzz even before the release. Almost all of his movies including Ravanaprabhu and Spirit with Mohanlal or Paleri Manikyam: Oru Paathira-kolapathakathinte Kadha, Pranchiyettan and the Saint with Mammootty had provided the real entertainment keeping the audience intact. As the three superstars (Mohanlal, Mammootty and Dileep) come together for a mass movie, it would be a real visual treat for the viewers who might not keep their mouth closed while enjoying them on big screen. Produced by Ranjith's Capitol Theatres, the camera of the movie is handled by Madhu Neelakandan. With most of the artistes present at Abad Plaza hotel practicing for the AMMA's upcoming stage show, the portions where Mammootty's character interacts with the superstars was shot with the normal shooting scheduled to start form 10th April. The switch on of the movie was held at Kochi few days ago with actors Innocent and Janardhanan doing the honours. Dj turned actor Sekhar Menon who sizzled in 'Da Thadiya' will be doing a prominent role. The next schedule will be starting next week at Kozhenchery and rest of the part at Germany.